Gardening is a very profound activity in many ways, and I believe that gardeners have the power for positive change for the greater good. When I interviewed one of the Guerrilla Grafters recently, I learned that it’s not all about the grafting. This founding member of the Guerrilla Grafters cares deeply about the society in which we live and our relationship with public spaces. Their grafting experiments are a proof of concept for connecting residents with their city. 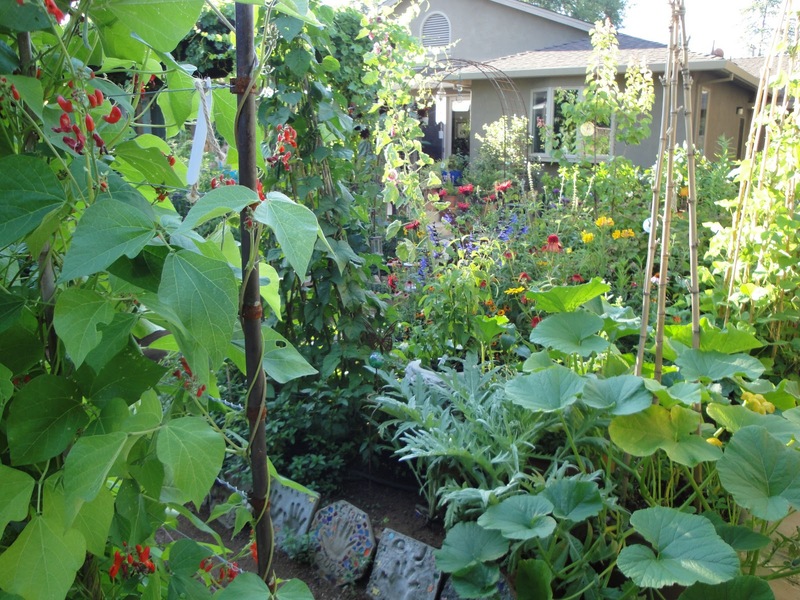 I can’t say enough about the benefits of edible landscaping with herbs. A huge benefit for my husband and me is purely culinary: we love to cook. Fresh herbs are expensive at the grocery store and not always available. Having fresh herbs just outside our door for picking at a moment’s notice is a perk we have come to take for granted; hardly a day passes where I’m not out picking fresh rosemary, parsley, or tarragon, for our meals. 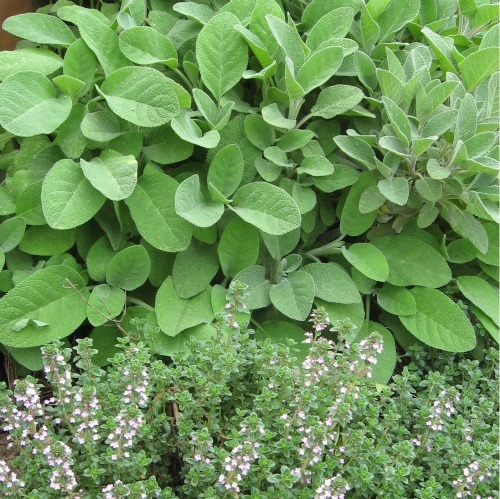 But there is another equally important reason for incorporating herbs into your edible landscape. Herbs do double-duty in the garden. 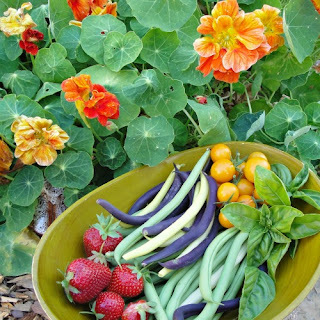 They are essential to the home chef, but they also contribute to a healthy garden ecosystem. Companion planting is the old (some say ancient) technique of planting certain herbs, vegetables, and other plants in close proximity so that one or both benefits from the presence of the other. The benefits come through different mechanisms: through the root system by sharing nutrients, or through beneficial secretions, (exudate), by stimulating microbes or bringing nutrients up to the soil surface, attracting pollinators with flowers, and deterring pests through herbal scents. Some benefits that have been observed are still mysterious, for example, the observation that basil improves the flavor of tomatoes when grown together. Companion planting can be complex and highly technical, but it can be distilled to a few basic herbs that will benefit your garden and kitchen. The following is a short list of popular culinary herbs that are reputed to be broadly beneficial in the garden. A good strategy would be to plant these in several spots near and among your vegetables. You'll have to plan on semi-permanent locations (edges of planting beds) for the perennials which will grow year-round in climates with mild winters, or will die back and sprout anew in spring if protected from freezing. Try growing the annuals from seed; many of them self seed for the next year. 1. Basil (Ocimum basilicum)- an annual; companion to tomatoes, improves growth and flavor; flowers attract bees. 2. Borage (Borago officinalis)- an annual with edible blue flowers that attracts bees; companion to tomatoes, squash, and strawberries, and deters tomato worm. 3. 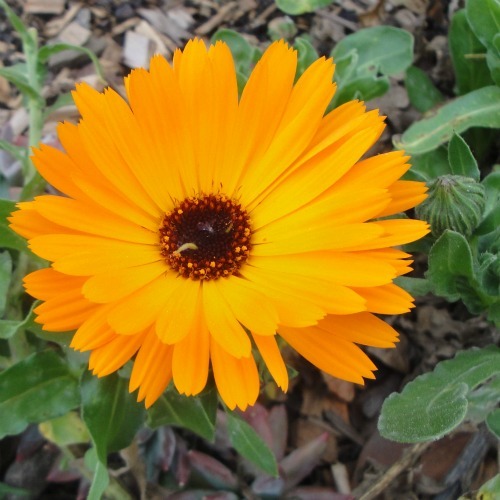 Calendula (a.k.a. pot marigold; Calendula officinalis)- annuals and perennials; a good companion for tomatoes but is said to be good for the garden in general to deter pests, especially tomato worms and asparagus beetles. Flower petals are good in salads and used as an antiseptic in ointments. 4. Chamomile (Chamaemelum nobile)-a perennial; companion to cabbage and onions; the tea useful against "damping off", a fungal disease. 5. French Marigold (Tagetes patula)- an annual; a garden standard for deterring pests, including nematodes; the Mexican marigold (Tagetes minuta)is toxic to many plants but highly effective against many nematodes). 6. Nasturtium (Tropaeolum majus)- an annual related to watercress with colorful edible flowers, leaves, and buds; use as a decoy for aphids, deters some beetles. Climbing and mounding forms (I prefer the mounding type). 7. Oregano (Origanum vulgare)- a perennial; highly aromatic;has beneficial effect on surrounding plants. 8. 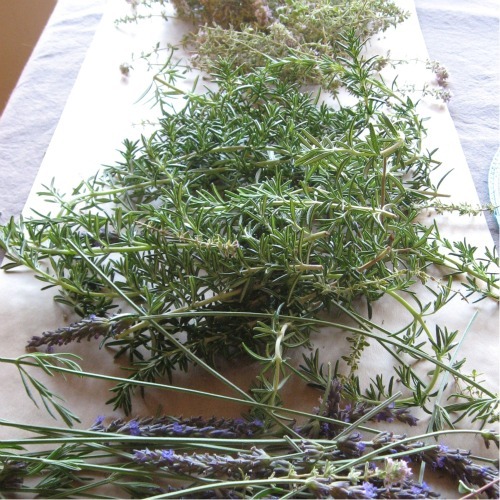 Rosemary (Rosmarinus officinalis) - a highly aromatic woody perennial with bush or sprawling forms; in mild climates will grow all year-round and the small blue flowers attract bees and provide forage in winter; deters cabbage moths, bean beetles. 9. Tarragon (Artemisia dracunculus)- a frost tender perennial herb; mulch during winter; beneficial throughout the garden. 10. 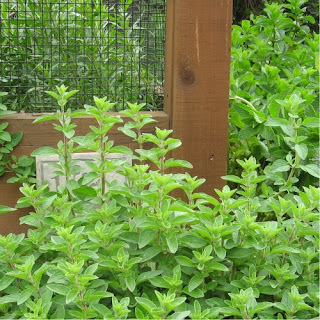 Marjoram (Origanum majorana)- a perennial that has a beneficial effect on surrounding plants, and improves flavor. Jerusalem artichokes, or sunchokes, are outstanding for making silky, thick creamy soups in combination with a variety of winter vegetables. 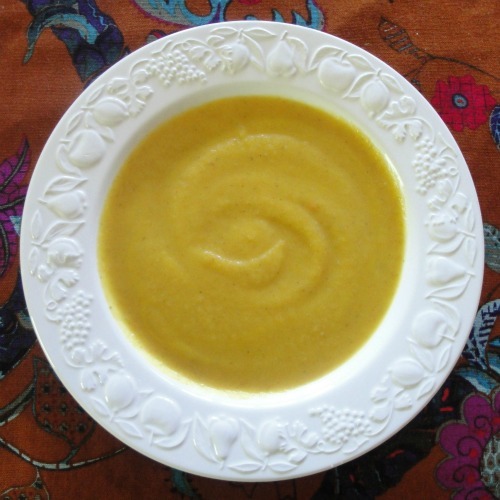 Adding cream or milk is not necessary to achieve a satisfying, delicious, elegant soup. Last spring we planted Jerusalem artichokes and this fall and winter we have been creating recipes to enjoy the tasty harvest from our garden. Jerusalem artichokes, or sunchokes, are native to North America and were first eaten by Native Americans. They are hardy and easy to grow and produce abundant sunflowers and edible tubers. You can find them at farmer's markets, select grocery stores, or from your CSA, but for a reliable supply throughout the fall and winter try growing them yourself. 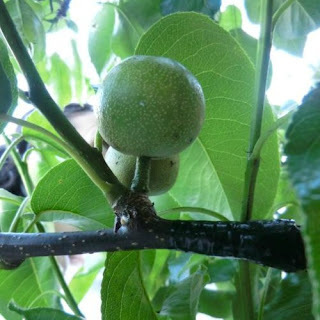 They have a mild nutty taste, and are perfect for growing along a sunny fence as part of your edible landscape. See my previous post for more details and a recipe for sunchokes and sautéed mushrooms. Cooked sunchokes have a creamy texture and earthy flavor that makes for really delicious pureed soups. 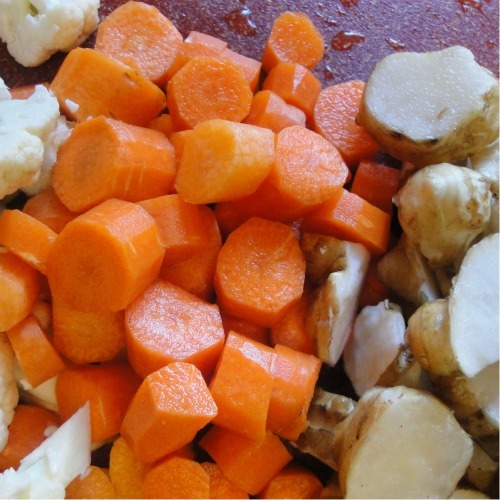 You can make the soup with different veggie combinations. Try potatoes, cauliflower, broccoli, winter squash, or even spinach. Scrub any remaining soil off of the tubers with a vegetable brush under running water. If you have trouble cleaning between the bumby parts just break them up. It's not necessary to peel off the thin skin. Slice the tubers about 1/2 inch thick. Add more broth if needed. Season with salt and pepper and the curry powder, if desired. Using an immersion blender (stick blender) or conventional blender, puree the soup until all of the vegetables have been processed into a silky, smooth, thick soup. Add more broth or water if it is too thick. Serve warm immediately or store in the refrigerator in an airtight container to use within a few days. I couldn't resist buying one of these curious and spectacular citrus (Citrus medica var. sarcodactylus) at our farmer's market. It looks like an elegant sea creature! Hamada Farms has been selling them last fall and winter in our area (SF Bay Area). 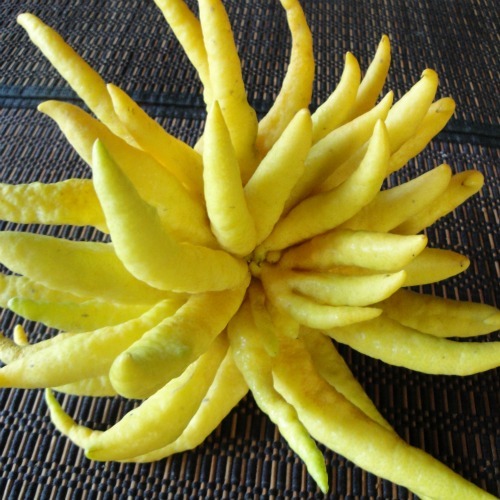 Known as the Buddha's Hand Lemon or Buddha's Hand Citron, it grows on a frost-tender small tree. Apparently the fruits take a long time to develop, and easily weigh about a pound each. The tree is quite a sight with several of these hanging from it. The Buddha Hand Lemon is surprisingly fragrant, and that's what makes it popular, in addition to its unusual form. It's also unique in that it is filled with white pith and no pulp or juice, but the pith is only slightly bitter and the rind is wonderfully citrusy. Use the zest in recipes calling for lemon zest, or preserve it for use in baking, ice cream, or yogurt. After displaying it on my dining table for a week I preserved it in a simple syrup to use in baking and other recipes, but you can also make candied lemon pieces. In a large sauce pan, heat the water and stir in the sugar. Keep stirring the sugar until it is all dissolved- being careful not to burn it. 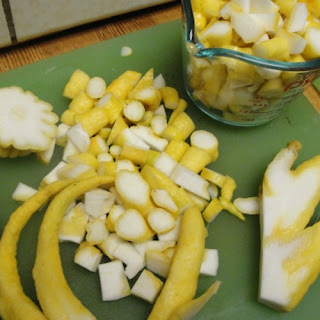 Add the chopped lemon pieces and let them simmer, stirring occasionally. Cook until they turn translucent as shown in the photo below. It will take about 20 - 30 minutes, or more. 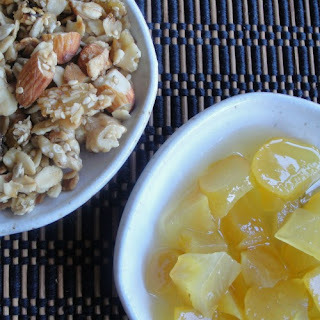 I added finely chopped preserved Buddha's Hand to my granola recipe- yummy! Let it cool until you can pour it safely into a clean quart size canning jar. Store in the refrigerator with a lid on the jar when it has completely cooled. It will keep for several months. They had to leave their stock behind, say goodbye to beans and rice. We are sadly undermined by the people that we serve. Now it’s fear of regulations that keeps us up at night. We fear the strangers at our door are from the government. And wash pollutants into waters from our agri-business soil. But true homeland protection needs food security. Last June our dear tomatoes were underneath the snow. We have had to tell our neighbors we can’t sell them eggs no more. And millions in this country have no food to feed their mouth. And we import berries for our grocers to line their winter shelves. Small farmers stand and watch, saddened and dismayed. We are a group of faith: That’s what farming is about. We see a light that shines before us, under a sky devoid of stars. We are our nation’s farmers, we are the one percent. 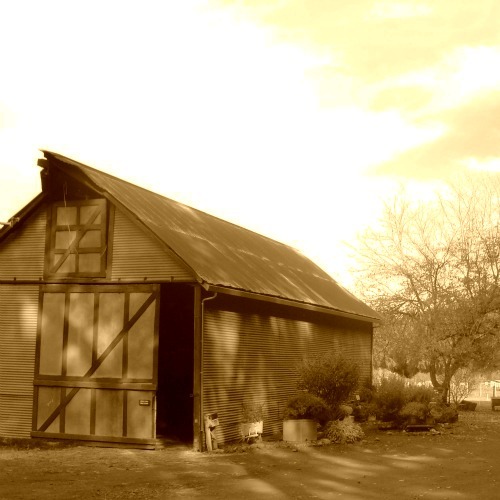 Hilary Hodge is an organic farmer from the tiny and amazing town of North San Juan in Nevada County, California. She graduated with a degree in English Literature, and after 7 years in social services, quit her job to return to the land. 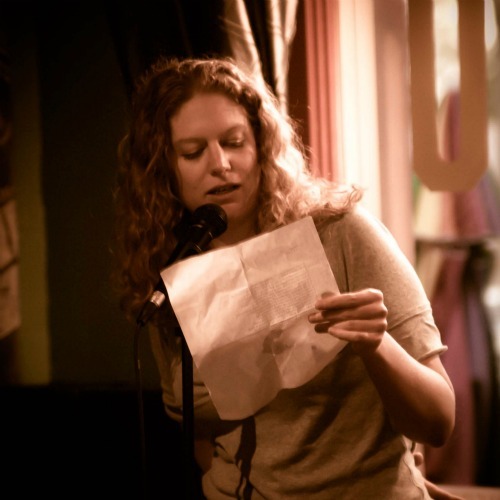 She blogs about sustainability, sharing her passion for farming, social justice and localism. You can read her work at her web site here. Imagine what your personal garden might be like if you were the co-founder of Seed Savers Exchange. 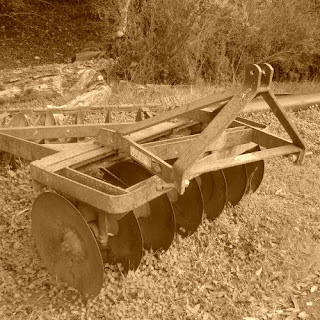 I had the opportunity to find out recently at a talk given by Diane Ott Whealy at Common Ground Organic Garden Supply and Education Center in Palo Alto, CA. After spending the bulk of her life working hard to build the non-profit Seed Savers Exchange, she now enjoys being a gardener again without the responsibilities of feeding a family and growing an organization. She maintains a display garden at the Seed Savers headquarters, Heritage Farm, the Whealy’s former home in Decorah Iowa. Her approach is informal and loaded with enthusiasm. The effect is a lush riot of texture and color with foliage and flowers to attract pollinators, and a feast for the senses. This technique of interplanting and companion planting creates a garden ecosystem that birds and insects love- the birds help control the insect population which will be a mix of beneficial insects as well as pests. Her display garden has about 500 species that include heirloom vegetables, old fashioned flowers and herbs. Some of her favorites are: Grandpa Ott's Morning Glory, Bees Friend (a flower from Germany), Scarlet Runner Bean, Moon and Stars Watermelon, and Five Color Silverbeet Swiss Chard, among many more. Ott Whealy explained that the mission of the organization is to inspire people to grow the seeds: Seed Savers Exchange can save seeds but they cannot maintain gardens everywhere, therefore home gardeners are the key to keeping the thousands of useful plant varieties alive as they propagate them and share them with each other. "the definition of an amateur is one who loves and cares"
You can order seeds directly from Seed Savers Exchange without a membership, or you can join and become part of the network of gardeners who exchange seeds and support the organization and their programs.